Now that the Government scrappage fund has come to an end, each manufacturer is approaching the market in a different way with a number of complex scrappage schemes that rely on an old vehicle to exchange or scrap. Mazda has taken a different but simple approach, which is to make offers available to all customers, ensuring anyone who wants to buy a new Mazda can benefit from a great deal at a fair price. “The Government scrappage scheme was a great way to get new customers into the showroom and remove some of the older, less environmentally friendly cars from the road,” commented Mark Cameron, Sales and Marketing Director, Mazda UK. “We benefited from the scheme taking more than our fair share of the scrappage market, but it did discriminate against anyone who did not have a 10 year old car to scrap. “Now that the Government scrappage fund has run out many manufacturers have launched their own version of the scrappage scheme. In fact, there are now so many different offers with different terms and conditions, some on 10 year old cars and some on seven year old cars, that choosing the best scheme is both difficult and confusing for the customer and requires a car to part exchange or scrap. Mazda participated in the Government’s scrappage scheme from the start, resulting in over 10,000 additional customers enjoying the benefits of Mazda ownership. 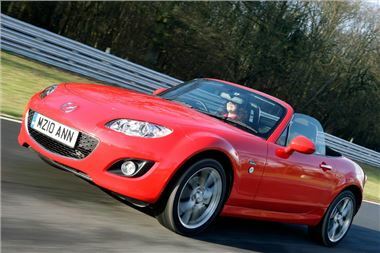 Bucking the trend of the economic downturn, Mazda UK achieved its third best year in 2009 since the marque arrived in Britain in the 1960s and saw its retail market share reach its highest ever at 2.4 percent. Meanwhile, the brand achieved its eighth consecutive year of growth in the UK; a feat that no other major car brand has achieved. Mazda has a compelling range of offers including typical 0% APR* finance with only 50% deposit required available across the range and deposit allowances of up to £1,000 for customers that opt to finance their car through Mazda’s PCP products. In addition to this, a range of customer savings has been introduced including, for example, up to £1,250 on all Mazda MX-5s, including the recently added 20th Anniversary Limited Edition model.